The year was 1978. The Pace Car selected for the Indianapolis 500 Race that year was the 1978 Corvette, which was celebrating its' 25th anniversary. The 1978 Corvette Pace Car was a beautiful silver and black 2 tone paint scheme. 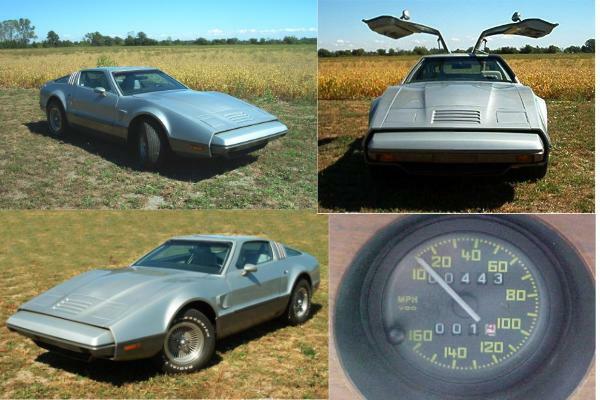 Here is the story, as I recall, as relayed to me, about how 1976 Bricklin VIN 2884 came to be silver in color. It was the winter of 1978, and there were a number of 1976 Bricklins in storage at a Byers warehouse. The snow was so heavy that the roof collapsed, and some of the still unsold 1976 Bricklins took on some damage. Byers had the parts so it was fairly convenient to repair the cars. One of the persons there really liked the 1978 Corvette Pace Car, and so when VIN 2884 was repaired, it was decided to paint it silver. The finished look gave the car a similar color theme look to the 1978 Corvette Pace Car. The bottom color of the Bricklin was already black, and the 2nd generation Trans Am air extractors, gave VIN 2884 air extractors, as the 1978 Corvette has air extractors.